In this guide you will learn what your timeline is, what are notifications, private messaging, how to search for people, sending & receiving friend request and much more. Let’s face it…Facebook can be downright confusing when you first sign up. 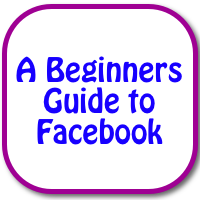 In this beginners guide to Facebook I’ll cover the basic anatomy of Facebook. Gone will be your frustration and you’ll be able to enjoy Facebook keeping up with your family and friends. When we first log into FB we are brought to our “home” page. This page is where everything happens. We are always able to get back to this page by simply clicking on the Home button located at the top right. We are going to start at the very top and work our way down the page. To search for people, places or things you simply click where it says Search and start typing in who or what you are looking for. The below illustration is for those that have the new Graph Search on Facebook. Facebook even suggest things you can search on but for now just know this is where you search for people, places, business and things on FB. Friend Request, Messages, Notifications…oh My!!! Friend Request Icon: This is where you can view your friend request. These are people who have requested your friendship on FB. You will see that FB looks at who your friends are and will suggest people that you may know also. If you see someone you know on this list and want to request them as a friend then click the icon Add Friend and a request will be sent to them. Messages: Right here is where you can send and receive PRIVATE messages from friends. When you send a message the only person that will see this message is the person you sent it to or If you receive a message from someone then you are the only one that can see it…unless the message was sent to a group of people on FB. Notifications: This is where you will find your notifications. Notifications let you know when people take actions on Facebook related to you. Some notifications can be people liking, commenting or sharing your post, pictures or videos. Whenever you see a Red square with a number in it, that is letting you know that you have that many notifications ready for you to view. Let’s head over here to the left hand side of your page. This gives you a quick way to jump to your news feed, any messages you may have, your photos and anything you have chosen to be a favorite, which is basically things you visit the most. Below your Favorites you’ll see any Pages that you administer or have created, then groups you are a part of, Friends and any list you have put them on, Apps you have on Facebook and more. Now let’s get into the News Feed. The News Feed, which is the center column of your home page—is a constantly updating list of stories from people and Pages that you follow on Facebook. News feed stories include status updates, photos, videos, links, app activity and likes. From your news feed you are able to like, comment or share whatever you choose. Keep in mind, that when you take one of these actions on a status update, photo or video, depending on what they had the privacy settings set at, your friends will be able to see what action you took. For instance, if you were to “like” an image you saw in your News Feed then it will show up in your friends ticker located to the right and they will see what action you took. Or you can click or hover over a story to join in the conversation or take an action on the story like so. Also, you have the ability to hide or show the ticker by clicking on this little icon. SIDE NOTE: According to Facebook, the Ticker only shows up for people with a certain level of account activity. So if you do not have a ticker it’s probably because you are not connected to people or Pages that use Facebook a lot, so there’s not enough activity to make ticker useful to you. Also, Facebook does have an updated news feed coming out very soon, some of you may already have it, but from what I understand the Ticker is going away so this may be obsolete in the near future. Okay now on to YOUR Timeline. To get to your Timeline simply click on your picture located at the top right. Add a cover photo and profile photo – A cover photo is the larger photo at the top of your timeline, right above your profile picture. Like your profile picture, cover images are public, which means anyone visiting your timeline will be able to see them. You can edit your basic information (ex: contact info, relationships, work and education) by clicking Update Info then clicking on any Edit button in the top right of each section, enter your new info and click Save. Jump to stories from your past – by scrolling through your timeline, or use the menu of dates on the right side of your timeline to jump from year to year. Just click a year to see what was going on in your life during that time. View a log of your Facebook activity – Your activity log is a tool that lets you review and manage what you share on Facebook. If you liked a status or photo last week you can go to your Activity log and find it there. Keep in mind that only you can see your activity log. You can tag friends, pick a date for the story, add a location or tell people what you’re doing or how you’re feeling. You can view your photos that others tagged you in or view all the photos you have uploaded. From here you can also view any albums that you have created. This is where you can add more photos, albums and any videos that you want to share with others. Every timeline is set up the same way. So if you wanted to visit your friends Timeline you will be able to find out all about them (well the parts they want to share with you lol), by clicking on their About tab. You can also view mutual friends you may have, their photos and other topics of interest as well. Private Messaging – Who can see what? To send them a PRIVATE message click on message. This box pops up and you are able to send a file or an image. Write your message then click on Send. This message will not be seen by anyone other than the person you messaged. Posting on your friends timeline will be seen by others. When you post on your friends timeline others will be able to view what you have written or shared. For example, my sister has a friend of hers, which I am not friends of, share a post on her timeline that I was able to see. So keep in mind when writing or sharing with a friend on their timeline, others will be able to see it. There you have it. A quick overview of Facebook and what each component is. I know there is so much more to Facebook so I will be putting together more videos and tutorials to get you up to speed. If you would like to watch me walk through this tutorial you can view my YouTube video that as of today (2/19/14) has almost 28,000 views. What is one thing that you just can’t seem to wrap your mind around when it comes to Facebook? Let me know and I’ll be more than happy to help you so that you can fully understand the power of Facebook. I am new to facebook. My grandchildren have begged me to join in the fun, photos, etc. I am soooooooo confused. How do I get rid of all the postings taking up my time in scrolling? Hi Olga, Since I am the only one that uses my computer, other than my teenager getting on their and hacking my FB for fun LOL, I usually always stay logged on to Facebook. If I access my FB account through another computer or device like a smartphone or tablet I will ALWAYS log out. Keep in mind though that if you are logged into Facebook and you are reading articles online and click the Facebook “Like” button then your friends will see that in their newsfeed and know what you are reading and liking. For example, after this post I have the Social Media icons and one of them is the FB “Like” button. If you were logged into Facebook and clicked that like button then your friends on FB would see that in their newsfeed and might follow the link to it. produce a hebrew version of my own. Your permission and blessing much needed. Thank you so much for the vote of confidence. You may absolutely use this video to produce a Hebrew version, many blessings to you for it. Can you do me favor? I’d LOVE to see it when you’re done. I’m just curious how it’s going to look when it’s done. 4. Check the box for Everyone Can Post and if you want anyone to be able to add photos or videos make sure you check that one also. and you’re done. Now anyone can post on your page. I would like your permission to link to your Facebook Tutorial video from our training portal with full credit to you. After doing some research I found that you had the best Facebook Tutorial. I am the digital literacy Program Development Manager for a Kentucky-based non-profit that’s interested in ensuring that people have the basic skills to use applications that are available via the Internet. Wow, what an honor. Yes, you absolutely have permission to use the tutorial. I’m just glad that others have been able to utilize the video and learn about Facebook. As I’m sure you know, it can be quite daunting and overwhelming when you first arrive on it. Thanks so much for contacting me and I hope it’s able to help others better understand Facebook. Hi Audrey, I would just like to say thank you for creating a tutorial that makes it so easy to understand the basic principles of facebook. I have been looking online for weeks trying to find someone to give me some simple straight forward training so I can understand how to begin as a complete newbie and was getting nowhere up until now that is. I will definitely be looking out for any other training you make available as I think your training is excellent and the way to go for me. Thank you for sharing your wisdom with us in an easy step by step tutorial and now I can finally actually see a way forward for me on facebook. Comments like your’s always bring a smile to my face, warmth in my heart and is the best payment of the time it took to put together. Thank you so much for taking the time to comment and I am working on putting many more videos together to help out even more, be watching for them.